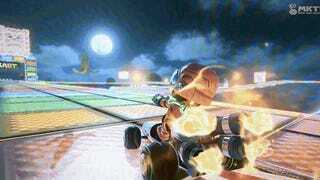 Plenty of people claim to be expert banana snipers in Mario Kart 8. Few can actually show for it. Imagine my surprise, then, when I saw someone boasting online about "banana sniping like a boss," and they actually were. This moment is perfectly captured thanks to some clever editing and a highly appropriate soundtrack. I love how it slows down to a crawl when the Mii racer goes into a drift, picks up the last banana, and chucks it at the Donkey Kong racer who's about to cross the finish line. 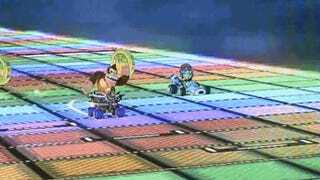 And then just before you get to see if the banana hit its target, the Rainbow Road track does one of its little wobbly moves—blocking the Mii racer's vision. Especially when that opponent is Donkey Kong. Oh, the irony. Delicious, banana-flavored irony.